I couldn’t count the number of times we have been floating in the lineup at Petrof Glacier daydreaming about having the M/V Milo anchored up right there with us. In our little dream she would be there rolling in the swell waiting for us to have our fun then return to her for a nice hot shower, dinner, maybe a soak in the hot tub before crawling in a bunk for the night just to get up early and do it all again. Keep dreaming my friends, they do come true! There’s a knee high wind swell hitting the Homer Spit today. I’m inside working on the computer to that all too familiar tune of water dripping down the rain gutter just outside my window. I can’t complain though, yesterday evening I paddled my stand up board for about 4 hours and easily caught my subsistence limit of red salmon as the sun set over the calm and rain free waters of Tutka Bay. Today I’m excited to share a short video documenting a stellar trip to Petrof Glacier earlier this year. It’s high definition so please go fullscreen and let it load for a couple minutes to fully enjoy the 5 minutes of reverie. The swell forecast looked strong for three to four days over the weekend but the flying forecast was marginal. For the first three days the clouds were hanging thick around the Kenai Mountains preventing us from flying through them to our favorite fly-out surfing paradise in the wilds of Alaska. The morning of the last promising day of the swell also brought some hope for a flight. Just one shot before I collapse into bed. It's a race against the fog and the rising tide. We barely snuck in, now the plane has to sneak out. Yet another successful fly-in fly-out surfari to the Petrof Glacier break. Something to put in the back of your mind for the next time you are scheming on flying over a coastal mountain range for a day at a remote surf break . . . What you see on your side is likely not what you’ll find on the other side. This was the certainly the case on January 30th when we loaded up the Homer Air Cessna 206 with surf boards and a little survival gear and headed up over the Kenai Mountain Range. 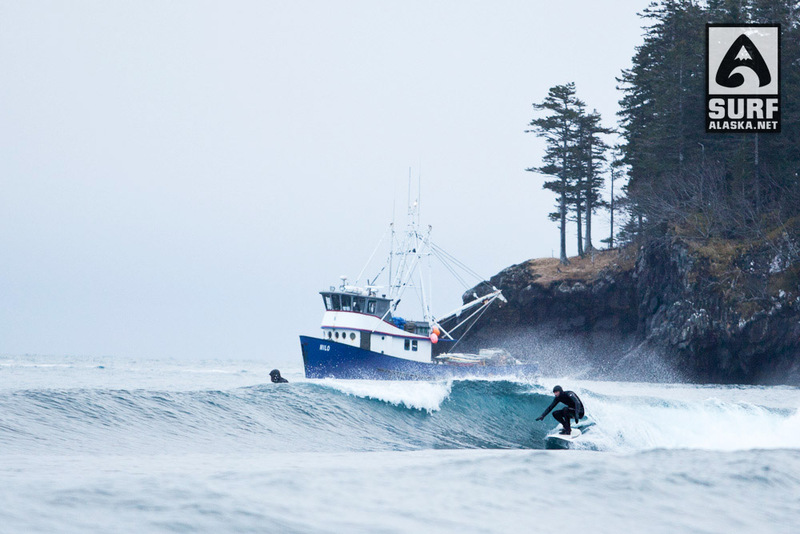 Scenic glacier and mountain views on our fly-out surf trip to a remote surf break in Alaska. This time we did suspect that we might see some fog, but just couldn’t resist taking the gamble. The coastal fog was pretty thick as far as we could see as we came over the mountains. It was all smiles and surf stoke when we saw a swell crashing on the beach through a little sliver of a window in the fog right over the very beach we needed to land on. Iceman surfing a remote surf break in Alaska near Petrof Glacier. As promised, this post is the meat and potatoes of our last fly-out surf trip to Petrof Glacier, Alaska. Check out the first half of this adventure, which is just getting to this remote beach, in my last post – Surfing Petrof Glacier 1.8.10 – Getting There. With the short daylight of the Alaskan winter we only had four hours to enjoy this swell so let’s get on with it! Below is a nice selection of photos from the day. I photographed for a few minutes, surfed for a few hours, then photographed for a few more minutes. Hope you enjoy the show.